In case you are using Windows 7 Starter edition & your laptop has a free port available for connecting another monitor or display device, you can connect dual or multiple monitors to your laptop running Windows 7 Starter Edition. Yes there is a catch here which is that with Windows 7 Starter, you will not be able to extend the display across dual or multiple monitors. In case you are not sure or you do not know about the Windows version running on your laptop, open up control panel and click on the System option as displayed below. 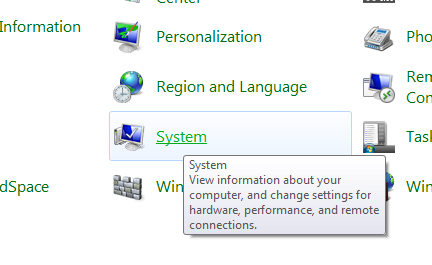 Once you click on System icon in control panel of Windows 7, a new screen will popup and will display which edition of Windows 7. In case your laptop displays that you are using Windows 7 Starter Edition , do not spend efforts extending your desktop to your external monitor, it will not work. You will need to upgrade your Windows 7 Starter to Home Edition or any other appropriate edition of Windows 7. You can also download a free trial of Windows 7 Enterprise Edition for free from Microsoft. In Windows 7 Starter Edition, you will be able to connect extra monitor but that would work only in clone mode.